After a glorious walk on the new Highline last Thursday a friend and I decided to grab lunch at what used to be called the Highline- Sea Thai in the Meatpacking district. It was the first non-rainy day in years it seemed so we grabbed a table outside and each ordered one of the lunch box sets. Mine came with Coconut Soup, Roasted Tofu Salad in Peanut sauce, Golden Shrimp Fritters and Garlic and Vegetables with Beef. I wasn’t expecting to like the Coconut soup but once I smelled the wonderful creamy broth I was sold. The broth was filled with peppers, mushrooms, scallions and big chunks of chicken. I wasn’t expecting to enjoy a bowl of soup on such a warm sunny day but it was fantastic. The Shrimp Fritters were pretty amazing as well. I’ve had these before a bunch of times at Spice but this was the best showing I think I’ve ever had. 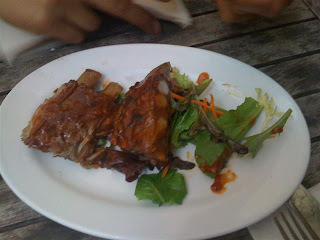 They were super crispy and came with just the right amount of sweet chili honey sauce for dipping. After some shopping in the East Village Tuesday night we headed over to our old standby yakitori joint Yakitori Taisho for dinner. We got there about 5:55 and the women inside told us they weren’t open yet but that next door was available. Next door? We had no clue what she was talking about. We walked to the left and saw a similar looking joint called Oh! Taisho. This seems to be some sort of spin off of the original. For the purposes of comparison I will call the spin off “Oh!” and the regular “Taisho” during this post. We decided to check it out and ordered our usual Taisho dishes to see how it compared. First up the Tuna Carpaccio. This came out looking a little different than Taisho. The tuna was in bigger chunks and there was a lot less lettuce. The tuna was definitely thicker than normal but still had the same salty sauce on top and the same mayonnaise on the side. 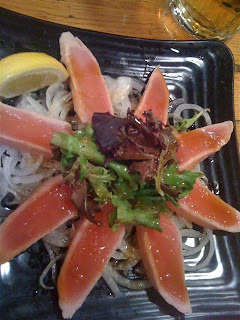 I really enjoy having lettuce with my tuna to cut the salty taste a bit and would have enjoyed some more on the dish. Saturday night we went to Momofuku Ssam Bar for dinner. It was packed when we walked inside and ended up putting in our names and having a drink in the Milk Bar area where they apparently know have guests wait for their tables. It was kind of weird having drinks in the dessert shop. The smell of cookies kind of overwhelmed me and I swear if they made us wait any longer than they did I probably would have ended up having some Corn Cookies for dinner. We got seat and ordered the BBQ Rib sandwich to start. Look familiar? Kind of like the limited time McRib sandwich from McDonalds? Oh but his is much much better. 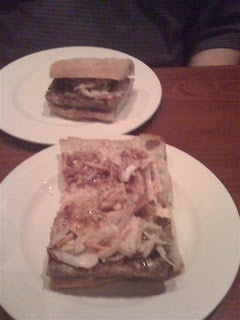 The meat was super tender and the red onion coleslaw on top was a perfect match for the smoky sweet sauce. 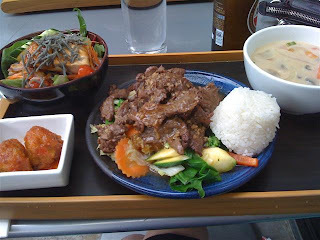 I was upset to see they had changed their menu and my Steak Ssam was no longer there. So instead I ordered the Bev Eggleston's Pork Shoulder Steak. OMG this dish was awesome. We decided to go and check out the new Highline Saturday so we headed over to the Meatpacking district. On the walk there we decided we stop off at Brass Monkey to grab some food. 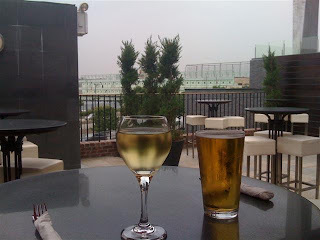 Although it was slightly rainy we went in and asked for a table on the roof. Luckily they had a small awning covering the tables against the wall and only two other ladies were eating there. We took a seat and ordered up some drinks. Yay!! This is what I like to see. Sometimes I get sick of the usual brunch mimosa. Why can’t they offer something else? Here they offered a complimentary Bloody Mary, Mimosa, Beer or Wine. What a great deal! So I got a Chardonnay and Mr. T ordered a Stella. Okay it might not be perfect brunch etiquette but that’s what I wanted to start off my day. So we sipped our drinks and looked out at sprinkling rain and the calm water until our entrees arrived. I ordered the Spinach and Goat Cheese Salad. This actually was supposed to come with some roasted beets but I asked for it plain. Sunday was the last day my friends from Vegas were in town. Their flight didn’t leave until 9:30 that night so we decided to pack in a few more things before they left. There were two things they wanted to do Central Park and Brooklyn. So we got up early and had a nice brunch right near the Alice in Wonderland Statue. I had grabbed a bed sheet from the closet for us to sit on not realizing it was one of the fitted ones. What a classic me kind of move. We all had to sit in the corners and not move so there was enough room and the sheet wouldn’t snap back. But it was lovely nonetheless. Then we grabbed their luggage and hopped on a train over to Park Slope. They had a friend who wanted to show them around his neighborhood (which basically means going to a bunch of bars). So we had some drinks outside at Cherry Tree and 4th Avenue Bar (Good Beer Selection at both) and then headed over to Alchemy to have one last meal all together before they got their flight. We had friends visiting last week from Vegas and spent quite a good amount of time eating and drinking our way around the city. We had some awesome Roast Pork and Congee take out from Big Wong, some slices in the sun at Artichoke and of course some hot dogs at Gray’s Papaya. All that stuff is great but we hadn’t really sat down anywhere to just eat. So on Saturday morning we decided to wake up and get a proper brunch. 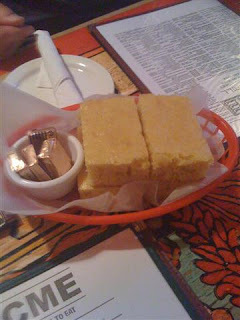 I was craving some grits so we headed down to Acme where they promptly started us off with a nice big basket of Corn Bread. It was nice and fluffy and served piping hot so the butter melted immediately upon contact. We all decided to order directly from the Brunch Pre-Fix which involves a free drink of some sort. I went with my usual Pineapple Mimosa, Mt. T got a Rolling Rock and my friend Chris got one of the spiciest Bloody Marys I have ever tasted. It was damn good. I mean serious sinus clearing good. When you want something tasty, cheap and quick there is still no better deal than Gray's Papaya. The price has gone up since I first moved here years and years ago but the Recession Special still holds strong. 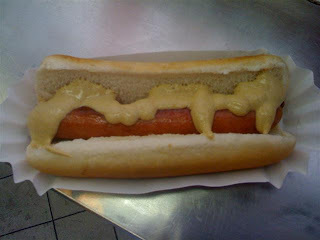 You get 2 of these marvelous dogs and a thirst quenching fruit drink for under $5.00. The hot dogs are nicely grilled and always have a nice snappy casing and a great bun to dog ratio. I always get mine plain and then add some mustard but you can get it with the works and it is still a tasty treat. This continues to be the best bang for the buck in the city. Skip those dirty water dogs, get yourself some Gray's. The other day I was in Astoria for work and decided to bring home some good Greek food for dinner. My friend used to live in Astoria and recommended Uncle George’s as one of his go-to places in the area. I swung by around 5:00 and the place was pretty empty. I sat down at a table and asked the waiter if I could have my order to go. “Sure” he said and then asked me if I wanted anything to drink while I waited. I looked at the menu and saw they had their house wine for $3.00 a glass. I figured what the hell. It’s $3.00 why not? See the funny picture of Uncle George on the menu! 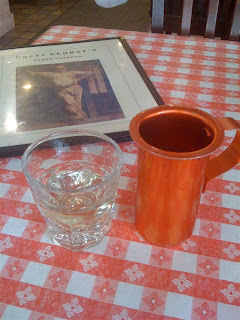 It came out in this little red metal carafe which was kind of cute. It went well with the red and white checkered table cloth décor of the place. I took a sip and decided that yes- this was a $3.00 glass of wine! However I have definitely had worse before. I actually only got a chance to drink about half before my order was ready. Man they were fast! Go out and get something sweet! After a beautiful Saturday spent walking around aimlessly I met up with some friends for dinner and drinks in Midtown at the Perfect Pint. We chose the Perfect Pint because they have a rooftop on the third floor with tables and TV’s for viewing the various games. When we got there the place was packed but luckily we scored a table after only a few minutes. We decided to order a couple appetizers to share. 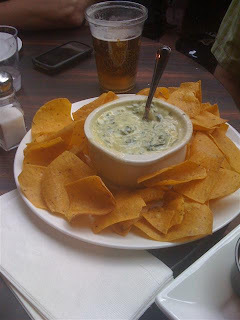 Our first dish was the Spinach and Artichoke Dip. The dip had a nice flavor but the texture was a little bit watery. I prefer a dense creamy dip and this was kind of thin. I didn’t really care for the chips either because they had obviously been fried twice. I hate when they do that. Tortilla chips only need a dip once and then a dusting of salt. Frying the chips twice kills the salty flavor and just makes them taste really greasy. Our other appetizer was the Chicken Fingers. 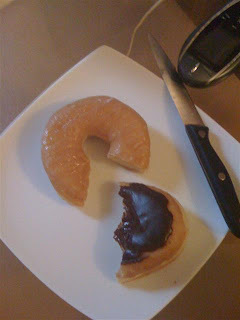 These fared much better than the dip I thought.